Marge, Bart, Lisa, and Maggie's heads are mounted on the back wall like trophies, while Homer is sprawled across the carpet like a bear skin rug; a hunter sits on the couch, puts down his gun, and lights up a pipe. "Two Bad Neighbors" is the thirteenth episode of season 7. It originally aired on January 14, 1996. The episode was written by Ken Keeler and directed by Wes Archer. "Homer's jealousy at all the attention his new neighbors, George and Barbara Bush, receive turns to rage when the former President gives Bart a spanking." Evergreen Terrace holds a garage sale. As Homer dances on the tables selling his junk, there is a diversion: the empty house across from Homer's is being moved into. It is occupied by former President George H. W. Bush with his wife Barbara. After Ned Flanders and his family came over to visit the Bushes and George takes a liking to Ned, Bart decides to visit, and Barbara takes a liking to him: However, Bart's habit of calling adults by their first names and his overall annoying attitude does not do much for George. Eventually, after Bart accidentally shreds George's newly typed memoirs, the former President takes Bart across his knee and spanks him. Homer is outraged and confronts George. Both men vow to make trouble for each other, despite that Barbara suggests to George that he should apologize to Homer. Homer sends bottle-rockets at George's window. George puts up an anti-Bart-n'-Homer banner, which confuses everyone else so that doesn't last long. Homer then glues a rainbow afro wig on his opponent's head just before he is to give an important speech to a local club after Homer placed cardboard cutouts of his sons, George Walker and Jeb on his front yard to trick him. George retaliates by chewing up the Simpsons' lawn with his car. Despite Barbara urging her husband to apologize, the confrontations continue. Homer and Bart are just making their way through the sewers to release locusts in George’s house, but he spots them from the sewer drain and climbs down to fight. Finally, after pressure from his wife, George apologizes, but sells the house as the neighborhood clearly brought out the worst in him. The vacated house is immediately bought by another former president, Gerald Ford, who invites Homer to watch a football game with him, and to enjoy some beer and nachos at his house. The two get off to a good start, sharing common ground. In September 1990, Barbara Bush said in an interview for People magazine that The Simpsons was the dumbest thing she had ever seen. 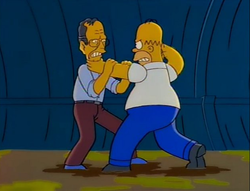 Five years later, an episode had George H. W. Bush and Barbara Bush move to Springfield and leave after George gets involved in a feud with the Simpson family. The The Simpsons: The Complete Fourth Season DVD set includes a special feature that presents an exchange of letters between the First Lady and show staff. In another address, Bush said that America needed to be more like The Waltons than The Simpsons, causing Bart to say they were a lot like the Waltons, since they were both praying for an end to the Depression. Wikisimpsons has a collection of images related to "Two Bad Neighbors". Despite the hype over the appearance of George and Barbara Bush in this episode, they were actually voiced by regular cast members Harry Shearer and Tress MacNeille. Dan Castellaneta voiced Gerald Ford. Modified on July 9, 2017, at 06:43.